Dr,….But what about bone density?? This is a question I am confronted with daily, when we discuss women’s health. When we started to do BMD testing on women, the availability of BMD machines were few and far apart. Initially we did BMD testing on older women who had fractures after injury. They were mostly post menopausal women in their seventies and aighties. We found many to be osteoporotic. We thus assumed that it is a disease caused by “estrogen deficiency” as a detriment of the menopause. It as a disease of changing lifestyle. When one exercise a muscle to be stronger, it enlarges (hypertrophy) if the muscle is not used, it atrophies and becomes smaller. The same happens to bone. If you do not use it and do not put weight and stress on it, why then the need to be strong. We now live sedentary lives of sitting and inactivity. We do not carry heavy weights any more and machines or computers are doing the job. Why need our bones to be heavy and strong? Our children are much less active during their bone building years up to 25 than before. Kids in the 1920-1980ties had to do many tasks and activities that bear weight and build their bone mass. Without these activities, the peek bone mass is lower than 50 yrs ago. They start off with a bone mass deficit, and will reach osteoporosis levels at an earlier age than before. Exposure to sun (Vit. D) is much less, being indoor kids. Our diet today lacks the essential raw and green vegetables so essential for good bone nutrition. Our affluent society consumes too much animal proteins that suppress Calcium uptake in bone. Our society is exposed to many drugs and chemicals that are detrimental to bone growth. Steroids are often used indiscriminately, and these drugs weaken our bones. Diuretics cause us to lose calcium. Overuse of antibiotics kills our intestinal flora responsible for Vit. K production. Many other drugs are detrimental for our bone health, and toxic, like chemotherapeutics. Toxic agents like alcohol, smoking, break down our bones and are socially acceptable today. Overweight women carry an extra burden, and are less likely to develop osteoporosis. Alcohol abuse and smoking cause low BMD. Chinese and Japanese women, although of small built, are less likely to develop osteoporosis. They eat more vegetarian and are more active into age. African women in rural communities are seldom affected by low BMD. They also go through menopause and hardly ever use HRT. 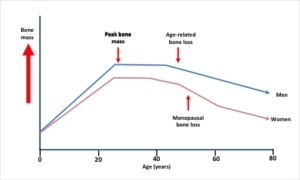 She loses bone faster than men in the menopausal years, but look at what happens after 60 when her estrogen levels are even lower: She stop the fast decline and now loses bone at the same tempo than men. This is strange and do not fit in with the “estrogen deficiency” hypothesis. Bone strength is a function of breakdown and new bone formation. The osteoclasts break down old bone and the osteoblasts fill the gap with new healthy bone. There are no estrogen receptors on the osteoblasts and thus no stimulation of new bone formation. At the most, estrogen inhibit breakdown of old bone by the osteoclasts. Bone density is thus seemingly preserved or decline slowed, but new bone is prevented from being formed. What were the conclusion of the WHI study regarding osteoporosis prevention and hormone replacement? Medscape: at this point, what are the primary indications for estrogen-alone therapy? Too much emphasis is placed on HRT for the prevention and treatment of osteoporosis. Many factors play a role in prevention, and more emphasis should be placed on lifestyle changes, diet and exercise. There are good bone support drug available for treatment and prevention other than HRT which have many undesirable side effect. 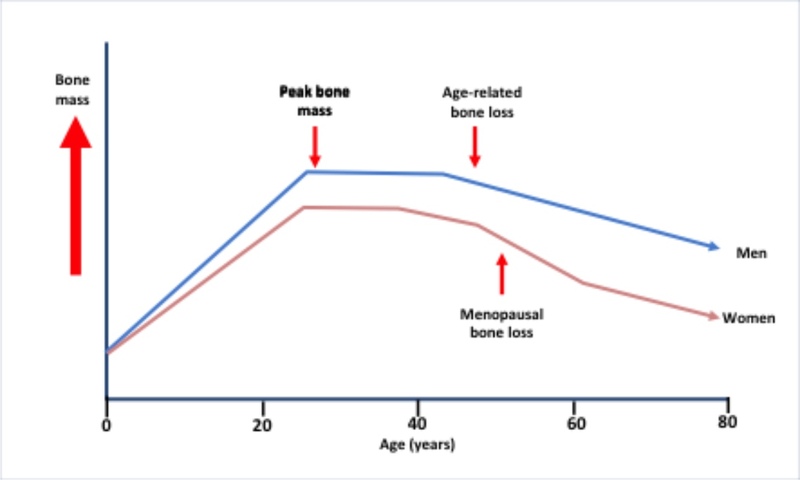 Bone density measurement should be started well before the menopause to identify those women at risk and to start specific measures to prevent their declining into the fracture risk category.